← I love a good mystery! I was all set to make a joke but then I saw this comment and really, there is no need. Bravo sir. Bravo. Simply brilliant comment, DarkSock…this one shall be framed and prominently displayed in my living room. It’s like if Maxfield Parrish was a crazy cat lady on acid. 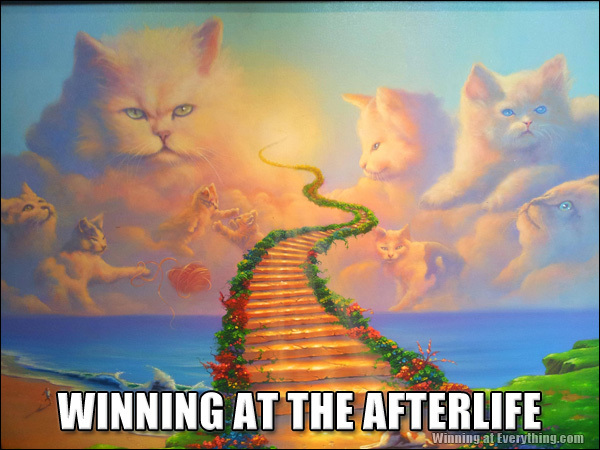 Nice to know that when I get to the afterlife, I will become a cat toy. I knew there was a reason that Fluffy has been sitting there and staring at me with that “look” for all of these years. IN YOUR FACE LISA FRANK!! !